However, hardly could anybody sleep that night in wake of excitement and strange fear. We began the trek early in the morning. We got up at 4 a.m. took a bus to Powari – base camp of our trek which is about 4 km from Reckong Peo. The holy trek started unfolding elements of excitement and fear as soon as we reached the base camp. It all started from a room of the Boys Hostel of Center of Excellence Sanjauli, Shimla in the month of October, 2005. Everyone from the hostel hurdled at the bus stop to wish ‘all the best’ to the group of eight trekkers. We took an HRTC bus till Rampur, from where we had to take another bus to Reckong Peo. Boys were excited as the name of the place sounded unique, and we were on one the most treacherous roads of the world. We felt the same impulse and goosebumps like we had heard when we reached the place called Taranda. Bus stopped for a while there and we got a chance to see all the dangers associated with it and a temple dedicated to Taranda Mata. 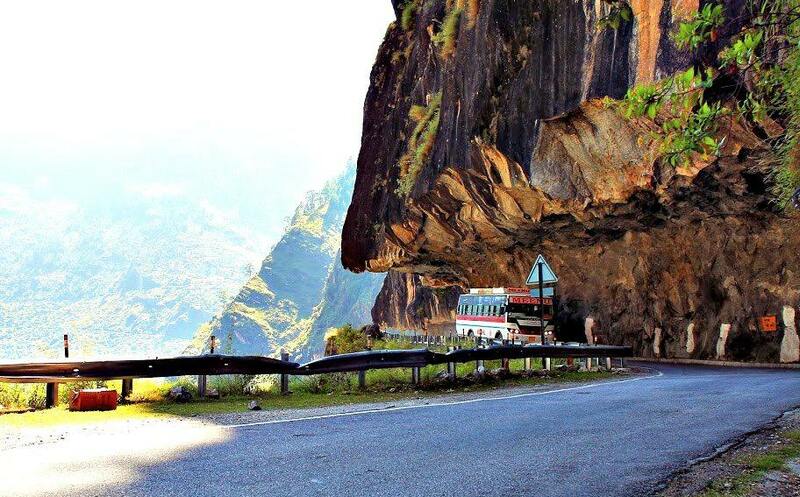 A deep cliff to the left falls about 500 meters down until it meets the mighty Sutlej River running along the road. One can easily hear roars of flowing water and feel its strength. We reached Reckong Peo at about 6:00 p.m. It is a beautiful little town. We could see the towering snow-capped peaks right in front of our eyes. Govt. College Reckong Peo was our stay for the night where we encountered a drunken night watchman, who finally agreed to let us in after a long, unnecessary argument. We explored the small market for some necessary stuff and food for the next two days, and came back. It was for the first time when we were sleeping in sleeping bags. Before passing into oblivion, we exchanged small, nervous words and slept because the next two were long and busy days. We had to cross the Sutlej, but there was no bridge to step on. We had to cross the breadth and height of the river in a small, human powered ropeway called Jhoola in local dialect. Everyone exchanged glances as to see and decide who will be going first. After a long contemplation, I and Chetan decided to go first. I was as the helm and Chetan behind me. I started to pull the rope of ropeway in order to steer us forward; at first it was as easy as fetching water from well, but after crossing half the distance, it became hard for me to pull that rope to move us an inch forward. I had to ask Chetan for assistance. As he tried to reach for the rope, ropeway started to sway vigorously and we got terrified. We sat quietly until ropeway came to a standstill. After that, I alone pulled the rope and finally crossed the river safely. It became easier for other trek mates to get on the other side as we helped them pull the rope. It was still dark and everyone had managed to cross the river safely. Every one of us laughed our lungs out while saying, “tu toh dar gaya tha.” As if this test was not enough, two paths, about 100 meters ahead, pointing towards two different directions started playing tricks with us. No one knew the right track, and there was no local person to be seen around whom we could have consulted. Then somebody from the group fished a coin out of his pocket and tossed it up in the air in very Bollywood style and said, “Heads toh right or Tails toh left.” And it was tails; meaning we had to take the left one and did the same. In next few seconds, we found ourselves heading on the left path. Surprisingly nobody objected. After an hour of walking, we found some local people working in apple orchards and asked them if we were on the right path. They said that we were on the wrong one. All looked at the guy who tossed the coin. They asked us to walk along the small canal that would lead us to a small stream accompanied by a little hill finally merging on the right path. We did as were told. The canal was broken near the stream and the other side showed a big landslide. Again confused, left with no better option, we chose to climb the hill. After climbing that small but vertical hill, we found a path which we were not sure was the correct one. We sat there for a while and drank some water. After filling our lungs with some fresh and cool air, one of us spotted a signboard with ‘Kailash Marg’ written on it. We were happy to be on the right track. Being assured that we were on the right path, we started taking long strides up the hill. By the time we reached Aashiqui Park – a beautiful meadow and a perfect camping site at an altitude of about 5,000 m (16,000 feet) – the at about 2 p.m. We forgot to fill water bottles in an utter confusion. All of us were feeling extremely thirsty. So we decided to find out some water source around. Searching for a while turned out to be fruitful. We found a small stream just a stone throw away. But as we tried to reach it, it took about 20-25 minutes. After having some water, we started again as we had to reach a cave – place for overnight stay – camouflaged among giant boulders in distant hill. We knew this because this information had been passed onto us by our seniors who had trekked this unforgiving route the previous year. 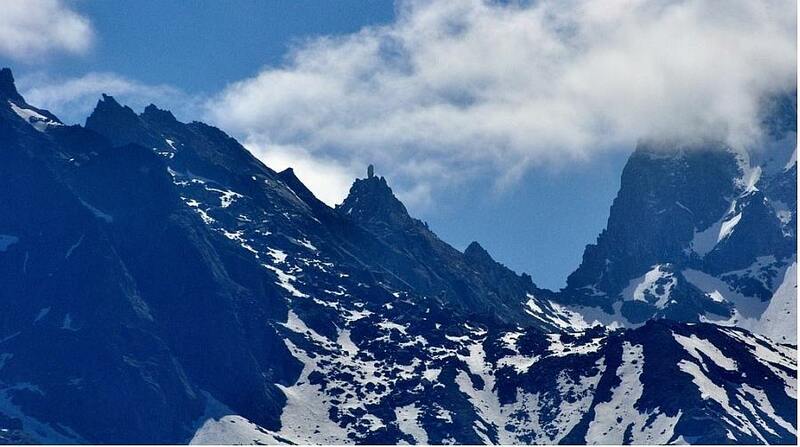 As we reached top ridge of the Aashiqui Park, we had the first glimpse of the holy Kinner Kailash. The path started to get scarier, narrow and slippery. We crawled through it, and finally managed to cross it safely to reach the cave by nightfall. To our amazement, the cave was large enough to accommodate 9-10 people. We rested for a while, and then started collecting twigs for making fire to cook. One of the trek mates got one of the tastiest dinners we have ever had cooked. We all had it while sharing good and bitter experiences of the day and circled around the bonfire to plan for the next day. As the night started getting colder, we decided to catch some sleep. As we lied down, we could see the star-studded sky from the mouth of the cave. It seemed as if we were ported into the celestial world. It was a great experience which we all will relish for life. 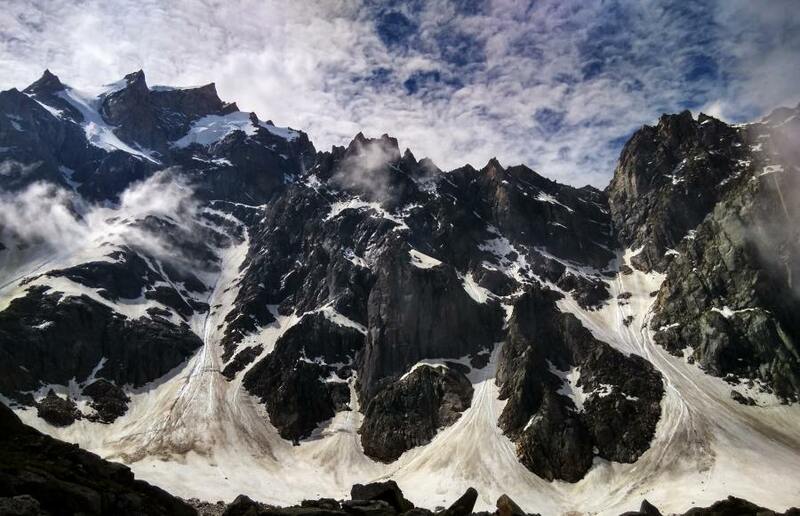 Next day we got up at 6:00 a.m., had a cup of tea, bread and jam, and started ascending the route. Now the path was all rocky. Most of the time, we were jumping from one rock to another in order to keep ourselves from falling in deep, dark trenches. No vegetation, whatsoever, was there. As the first ray of the sun kissed the mountain top, the whole surrounding became majestic. 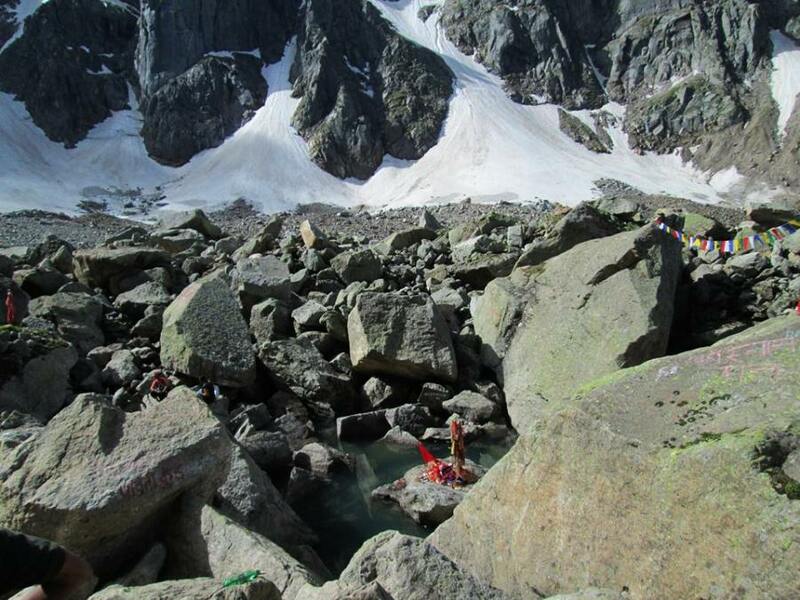 Until Parvati Kund – a small pond of freezing glacial water few hundred meters below the top – was moderate. We rested for a while here and performed some rituals. Afterward, trek started to get steeper and more difficult. We hit the snow just before reaching the ridge leading to the Kailash. As we walked the windswept ridge, we could see the entire valley shrouded in fog under our feet. After another 45 minutes of trekking, snow layer started getting thicker and thicker. We thought it would take us a few more minutes to reach the top, but a three feet layer of frozen snow made it difficult for us to move any further. As if this wasn’t bad enough, a strong wind started blowing and the snow started to fall off the ridge. Staying glued to the existing spot or retrieving back was the only option, because there was a steep slope on either side and endangering anyone’s life was out of question. 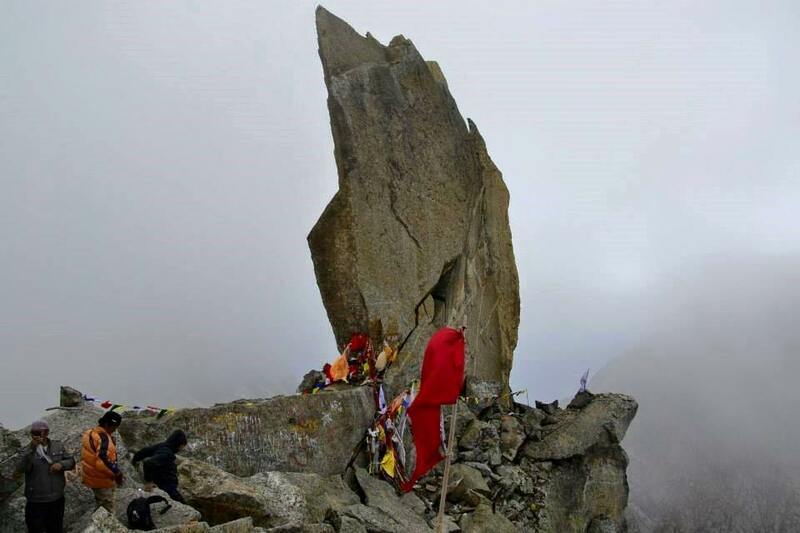 All we could do was watch helplessly at the Kinner Kailash about 150 meters away from us. Finally we decided to get back with heavy hearts. It was an emotional moment for all of us. Before retrieving our footsteps, we performed a ritual ceremony to express our gratitude towards ‘Him’ for pumping power in our legs and bestowing us with strength to come this far. We had one last glimpse of the Holy Shiva linga and majestic mountain ranges standing guard in His honor, and started descending back. We cautiously got back to Parvati Kund, drank some water from there and got back to the cave. We had some food followed by some rest and carried on. Fully exhausted, we reached Reckong Peo at around 7 p.m. Next morning we took a bus to Kaza as we wanted to visit Chandra Taal, and then reach Manali to complete the circuit. It was test of stamina, fitness and, of course, once-in-a-lifetime experience that will live in our memories forever. It took us lots of courage, determination and faith to complete the trek.